On 8 January, nearly 54% of our people voted for a new President and for a new Government with a mandate to establish the rule of law, to eradicate bribery and corruption and establish good governance. However, 16 months after the Yahapalana Government was elected, there is a growing concern among the people who silently came forward to usher in the silent revolution as to whether their aspirations are being met fully and will ever be met. The recent appointment of an individual accused of criminal misappropriation of 600 million as an additional secretary of an important ministry certainly does not augur well for the Yahapalana Government and can only strengthen the hands of the Opposition and justifies their rhetoric. In Sri Lanka, like most other South Asian countries, history has a tendency of repeating itself. In Sri Lanka’s political context the year 2015 saw yet another effort of an incumbent President attempting to hang on to power for a third consecutive term come to grief. After the advent of the executive presidency in 1978, the President repeatedly upstaged the other two branches of Government, namely the Judiciary and Parliament, in terms of wielding power. Nonetheless, the electorate did not want the same party or the same president serving for more than two consecutive terms. This was once more exemplified by the defeat suffered by President Mahinda Rajapaksa (MR), whilst trying to go for a third term at the 8 January 2015 presidential poll. History aside, MR was sent home for several other reasons, both political and economic. Fortunately he called for early elections, thereby being sent home packing two years early. If not, we may have been much worse off. The country was heading straight for disaster, in torment within, colliding against the West and sinking in debt. Among those reasons being the fact that MR had alienated the minorities of this country with his Sinhala-Buddhist chauvinism. The minorities led by the Tamils and Muslims comprise well over a quarter of the island’s population. And when the Sinhala Christian population is added on, those in total are close to 30% of Sri Lanka’s population. MR’s failed game plan hinged on trying to get that simple majority (50%+1 vote) for him to stay on in power, from the country’s 70% Sinhala-Buddhist vote. In this strategy, the so-called “coup de grace” was his win over the LTTE with which the country fought a bloody and destructive war spanning over a period of nearly three decades and which victory came to pass a little over four-and-a-half-years into MR’s first term, on 19 May 2009. However, when history is written in 20 years’ time, given the short memories we Sri Lankans have, MR will certainly be idolised for defeating the ruthless LTTE. That war win brought him a resounding victory when he called a snap presidential poll eight months later in January 2010, but five years down the line that steam had run out of power, with the electorate handing him defeat at the 8 January 2015 presidential poll. MR’s defeat cannot be construed as being equivalent to the electoral defeat suffered by Prime Minister Winston Churchill, England’s World War II hero, who, a few months after he oversaw the surrender of Nazi Germany to the allies in May 1945, was convincingly trounced at the hustings. The British felt that Churchill was good for war but not for peace, hence they booted him and his Conservative Party out of power at the polls. Nonetheless, six years later, the British electorate returned Churchill to power. In Sri Lanka, the story was the opposite. A few months after MR’s war win, he went for a snap election and won convincingly. But, five years down the line when he went for another snap poll, ostensibly relying on that same steam, with nothing more to offer other than hand-outs, the electorate sent him home. Sinhala-Buddhist chauvinism didn’t give him the sufficient votes to stay on in power for a third term. With the war being a thing of the past, the masses were more interested in jobs, the arrest in the rising cost of living (CoL), nepotism (family bandyism), corruption, cronyism, authoritarianism and racism, all politico-socio-economic issues, which were more blatant and pronounced with the war being a thing of the past during MR’s second term beginning in January 2010. There is certainly a lesson or two for the current group in this episode that they must surely avoid at any cost. 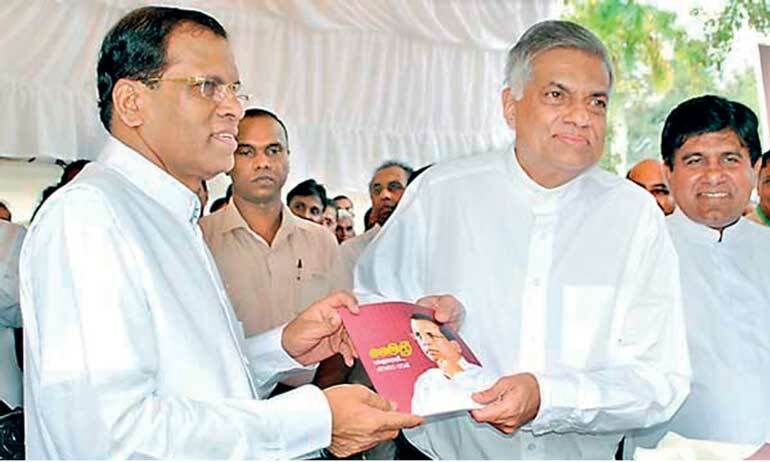 Maithripala Sirisena, with the support of Ranil Wickremesinghe’s UNP, the country’s largest political party, won the election on the promise of ‘Yahapalanaya’ or good governance. Essentially to reverse what was so blatantly going on. The Opposition therefore campaigned vigorously against corruption, accusing the Rajapaksa Government of siphoning off funds for their own family and leading the country to a future of international isolation and economic insolvency. Based on Sirisena’s campaign manifesto, the first order of priority was clearly the promised anti-corruption probes, cancellation of suspected sweetheart deals and a review of Sri Lanka’s foreign indebtedness—particularly to China, which had become a major provider of economic assistance and investment in recent years. The next priority of the Sirisena Government was, more specifically “compassionate” governance—seeking to restore the balance, vis-à-vis the responsibilities divided between Parliament and the presidency, scaling back the accrued powers of the presidency and tackling nepotism. Sirisena’s campaign promise was to focus on restoring Sri Lanka’s international image as well as strengthening its “cordial relations with India, China, Pakistan and Japan” and other important Asian partners (Thailand, Indonesia and the Republic of Korea). The campaign manifesto promised to improve relations with India, “with an approach that would be neither anti-Indian nor dependent”. The manifesto speaks only of taking a “humanitarian” approach to the human rights question and a less defiantly defensive approach to the difficult national question of ethnic reconciliation. Other than the passing of the 19th Amendment to the Constitution, an outstanding moment in our history, there has been more rhetoric than results and sadly a compromising of good governance principles. Our only hope from now on is that those entrusted with political power would live up to the people’s expectations and demonstrate their commitment to the true values of Yahapalanaya. The time has come, as the President himself once said to those who accomplished the November revolution, that they must also be ready to defeat a counter-revolution, if required. Therefore those who accomplished the feat last November need to wake up and defeat the old guard who have recently aligned with the Government and operate stealthy behind the screen, bringing disrepute to the Government to ensure the promised Yahapalanaya does not get buried for good. The window of opportunity to reform our political culture still lies with the President and the Prime Minister, two men who have outstanding ability to do good for the country and restore Sri Lanka to its rightful place in the world.